First off, absolutely no disrespect to the sausage sandwich. 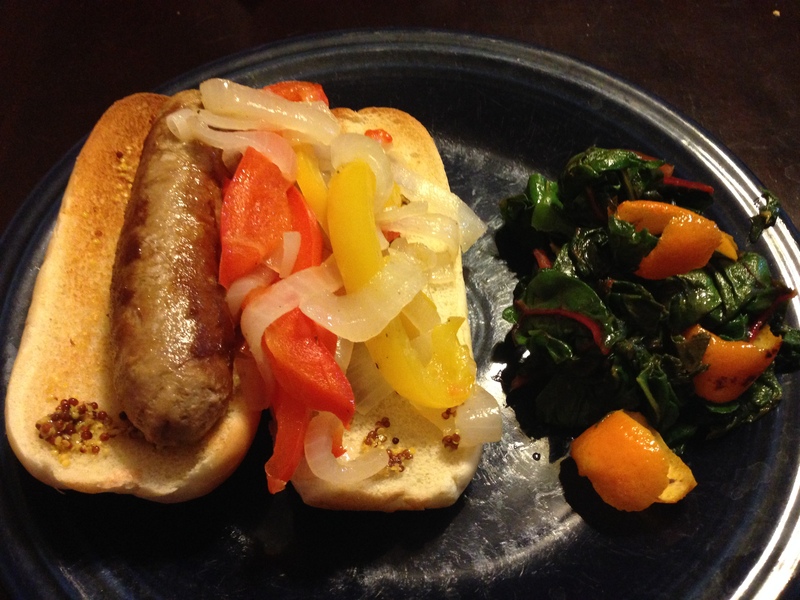 That’s a sausage with peppers and onions. That’s a sacred thing, even if it is turkey sausage. It’s amazing. You’ll love it. You should eat it. Second, that post title is a reference to the Valentine’s Day party that R & R’s used to have on the campus of the University of Illinois in the early 2000’s. I’ve dated myself so perfectly with this reference that I just had to point it out. If anyone was curious how old I am, now you know…pretty much to the week. Third, it’s the chard that was bitter. I’m not sure if you’re meant to eat orange peel. At least not in big pieces like that. And not until it’s been deliciously candied. I liked the actual chard, but oh my was that orange peel bitter! I’d say take the orange peel out before you serve this, but D thought it was delicious. He has a higher tolerance for bitterness than I do. Let’s put it this way: if you like IPAs, kale, and rapini, please eat this orange peel. If, however, I just named three things that you choke down, take the suckers out. Right off the bat, let me say that these two dishes were magnificent. And for so few calories. I said in December that I was anxiously awaiting some healthier fare, and this issue has been great. 368 calories for the pork tenderloin and a scant 261 for the wedges. Well, mine was probably a bit more than that. I have toddler, so I have whole milk in the house. But that’s it. The broth and pork and chard all come together to make something savory that tastes much more rich than it is. Then the polenta just makes it so gooey. It’s really comfort food. A note about the polenta. Did you know that polenta is yellow cornmeal? I think I hear some chuckling coming through the tubes, and I think I deserve that. I had always bought boxes or bags of “polenta” or “quick cooking polenta.” This recipe calls for quick cooking polenta. I reached into the pantry and discovered that I had maybe a 1/4 cup of polenta. Gasp! What to do? D offered to go to the store. I started googling how to make polenta thinking that someone had a neat trick. 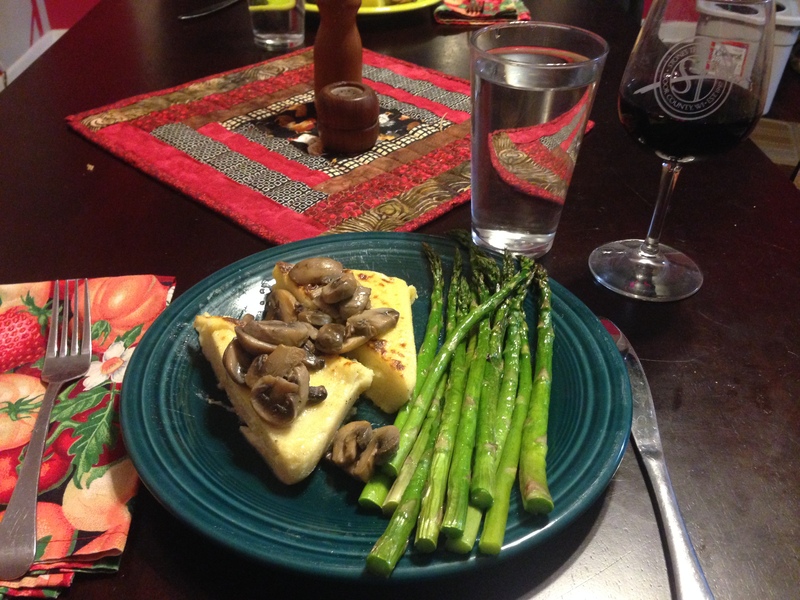 Alton Brown had a recipe…for polenta. It used yellow cornmeal. At that point, I was slapping my forehead. I got out my canister of yellow cornmeal and looked in. Yeah, that looked a lot like polenta. My polenta was always just ground finer than that. Kind of like the difference between instant oatmeal and old-fashioned oatmeal. Not since I found out that ponies were not baby horses have I felt quite so dense. Another note: this recipe is not a good candidate for quick-cooking polenta. Quick-cooking polenta comes together almost instantly. I’ve never had to stir it for more than a minute before it seized into a mass. This recipe has to cooking the polenta for 25 minutes. Try that with quick-cooking polenta and you’re going to be chipping that stuff off of the bottom of the pot with a pick axe. So use cornmeal! Tada! The polenta wedges are a great way to use up the leftovers. Broiling the wedges seemed kinda weird. Here I was taking blobs of polenta and grilling them(?) To accomplish what, exactly? To accomplish a wonderful crispy crust and a gooey interior, that’s what. Sold? Me too. As for the rest of the recipe, the note about only 2T of heavy cream making the whole dish taste luxurious made me roll my eyes, but they were right! It really did. Also, I used button mushrooms instead of cremini because of cheapness, and it was delicious. Use whatever mushrooms you like. Kale turns out to be delicious once you boil the weird out of it. On page 22-23 of this magazine, there are four sautés. They just kind of look like blobs of dark green stuff, so it’s difficult to tell at first glance what you’re supposed to do with the “in season winter greens” pictured. Just eat them? A quick glance at the under 100 calorie nutrition information for all of them should tell you that, no…you’ll starve. In steps the bubble on page 23. It states, “Enjoy the sautés as sides, toss with pasta for a main course (the chard’s great with Asian noodles), or serve on crostini.” I said, “Ok, bubble. I’ll buy it.” So I made the kale, the beet greens, and the chard. I’m going to get the less than awesome experiences out of the way first so I can end on a high note. Ok. The bubble said (and when has a bubble ever lied to me?) that the chard is great with Asian noodles. I still had a good amount of rice noodles in the pantry from the beef salad way back when. I asked for suggestions on how to get these things out of my house, internet, and the silence was deafening. Deafening. Either we are all at a loss for what to do with rice noodles or someone has the secret and she’s keeping it from me. 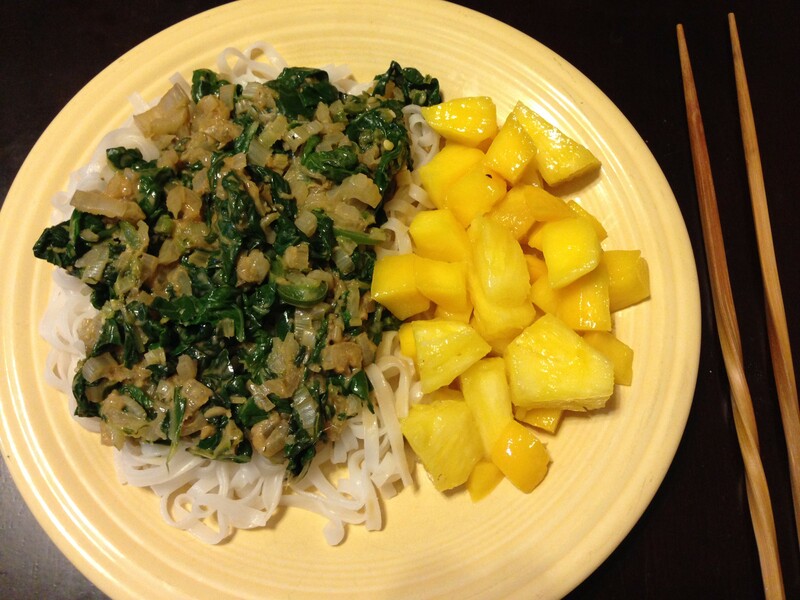 *narrows her eyes…* Easy peasy, I’ll toss the spicy chard with ginger sauté with the rice noodles. Here’s the important word in that recipe that you must pay attention to: “spicy.” The recipe has two sliced jalapeños in it. There’s no mention of seeding them, removing the ribs, or anything. That’s two jalapeños and to balance that out?… chard and ginger. Fun fact about chard and ginger: they do jack squat to cool down jalapeños. I made this recipe as written and it was physically painful to eat. And I love spicy food. I put it on the rice noodles thinking, “Here we go. The noodles will cool it down.” Nope. At this point, it was either throw it out or start doctoring it. I added a pretty considerable amount of peanut butter to the sauté. Maybe a 1/4 cup. It was still spicy, but not punishing. As the final touch, I served it with diced mangoes and pineapple on the side. Finally, after all that, we ate dinner. Whew! The upside: if you’re going to make this recipe, I highly recommend making a peanut butter-based sauce to put on top. I added a 1/4 cup of peanut butter. I could also see a mixture of peanut butter, sesame oil, and rice wine vinegar, not unlike my beloved Sesame Noodles. You will also want to serve this on noodles. I also recommend serving it with a cooling side. If I did this again, frankly, I would also use only one jalapeño and take out the seeds and ribs. Or coat your mouth with wax like Homer does before he eats the Guatemalan insanity peppers. Upside to that plan, you get to meet a space coyote. 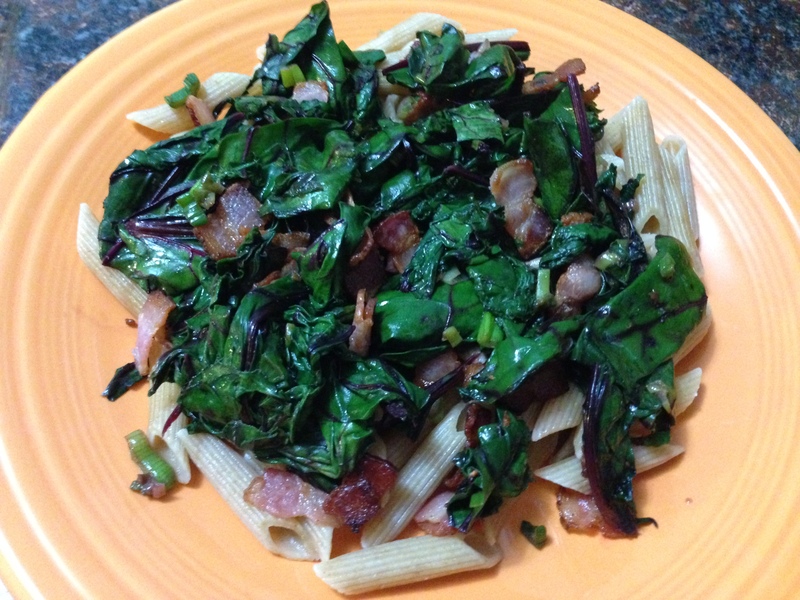 Then there’s the beet greens with bacon, which has the opposite problem. It’s pretty boring. Maybe the problem is that I tried to make all of these sautees into main dishes when this one should really just be a side dish. 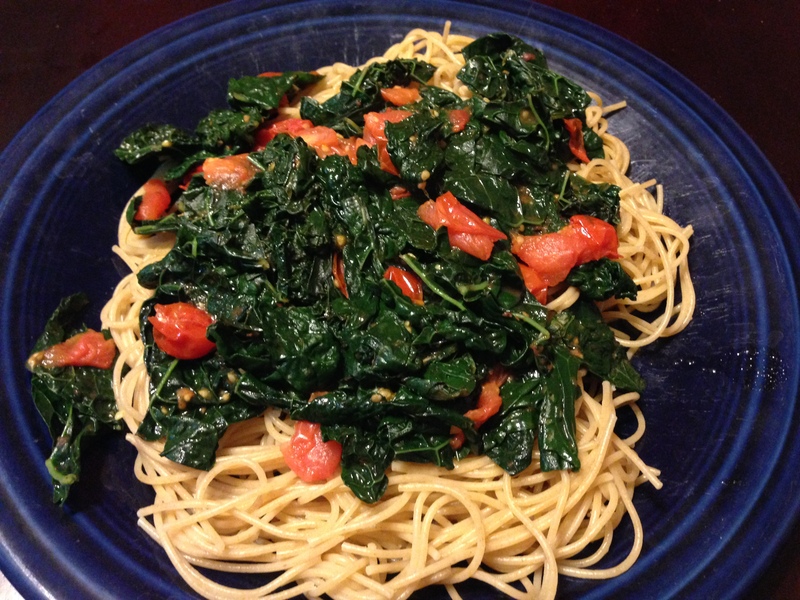 With that out of the way, we have an unqualified winner of a recipe to report: Kale with Tomato, Garlic, and Thyme. This one is as quick and easy as it is delicious. Sauté some veggies, boil some kale, boil some pasta (I think I might have used the same water), and toss it with salt, pepper, and oil. C’mon! Also, with the nice garlic and thyme, plus the intense green flavor of the kale, this prevents this recipe from becoming one of those dreaded Everyday Food pasta with no sauce recipes. Sorry for getting “Jimmy Crack Corn” stuck in your head. 1 1/2 pounds Swiss chard, leaves coarsely torn and stalks cut into 1 inch lengths. Roast those parsnips at 450 in one 1 T of oil, seasoned with salt and pepper. 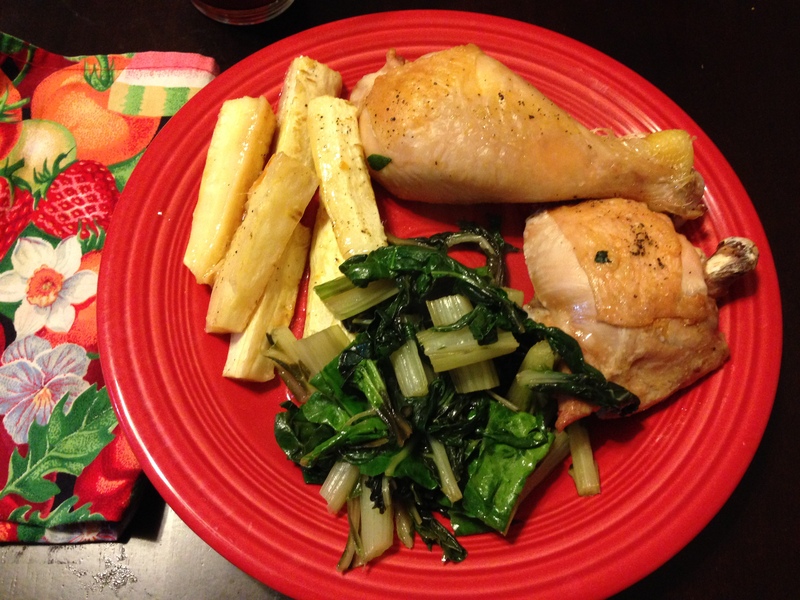 Push parsnips to the side, add the chicken, and then the fun really starts… Roast to 165 degrees, about 30-35 minutes. The fat renders off of the thighs and legs and fries the parsnips in chicken fat making chicken fat fries. So rich. So good. I’ve heard that some cooks are trying to bring back schmaltz. Hurry up! Sautee the stalks in the remaining T olive oil until crisp-tender then toss in the leaves. Toss and turn those leaves, adding more as it cooks down and makes room. It takes about 5 minutes to get all of the leaves cooked to tender. Remove it from the heat, stir in vinegar. Serve it all together. This chard side reminds me of when D and I were in a community garden and we always had way too much chard. 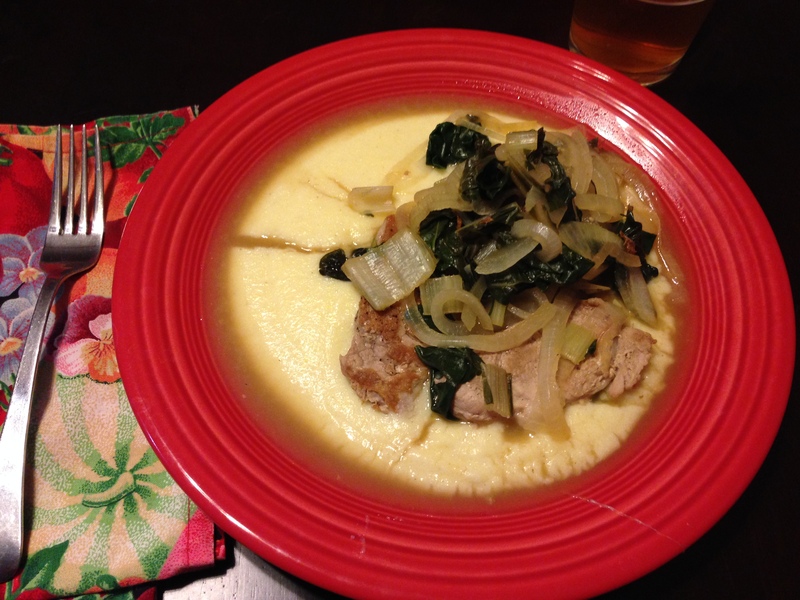 Our one criterion for a chard recipe was that it use a ton of chard. Our favorite was chard pie. This recipe probably would have made the cut because it uses a whole bunch, but it’s no chard pie. Over all, this was a great meal. It’s the kind of recipe I would have probably ignored back before I had to make everything. Plus, chicken fat fries. Yeah.